Millennials are quantum consumers raised in a world where online, on-demand video sources came of age, so we would expect uptake of legacy services to be a bit lower. 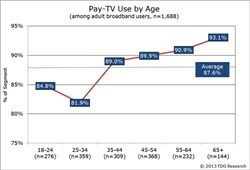 According to data released by The Diffusion Group, nearly nine in ten adult broadband users in the US subscribe to an incumbent pay-TV service such as cable, satellite, or telco-TV. The use of such services is greatest among adults 35 and older and less among younger adults. "The notion that we're on the edge of a 'mass exodus' from incumbent pay-TV services to online substitutes is not supported by the data," notes Michael Greeson, co-founder of TDG and director of research. "Today, 88% of adult broadband users subscribe to an incumbent pay-TV service, a rate that has held relatively steady for the last 12 months." That noted, says Greeson, specific differences in subscription rates by age are worthy of attention. For example, legacy pay-TV subscription rates among Early Millennials (ages 25 to 34) are 82%, compared with 85% among Late Millennials (ages 18 to 24). In both cases, this is notably lower than use among those 35 and older. Nonetheless, it is imperative that pay-TV operators execute on their promises to deliver the types of video experiences desired by younger consumers. As well, and regardless of age, operators must find creative ways to balance evolving needs with inevitable price increases due to the accelerating value of quality video content. As part of TDG's continued focus on the connected consumer and the evolving broadband video space, TDG recently published TV Viewing in the Age of Quantum Video, an examination of the TV behavior of adult broadband users, general and in relation to the frequency of using net-to-TV platforms to view various content types and sources. TV Viewing in the Age of Quantum Video is currently available for TDG Members to download. To purchase, or for more information about this new report, please contact our Research Services team.